The mural contest is open to students in any of the School of Design’s programs at The Warehouse. Syracuse University design students will soon have the opportunity to showcase their skills in a big visual way. The Connective Corridor, in partnership with the School of Design in the College of Visual and Performing Arts, is calling for student proposals for a two-part mural to be installed on the exterior of The Nancy Cantor Warehouse in downtown Syracuse. The contest is open to all current students enrolled in School of Design programs at The Warehouse, including communication design, industrial and interaction design, environmental and interior design, fashion design, M.F.A. collaborative design and M.S. museum studies. The two parts of the mural consist of the large horizontal wall facing West Street at the gateway to Armory Square and a smaller wall at the Washington Street entrance to the building. Applicants are invited to submit work based on principles of creative placemaking. Designs should reflect student creativity and connectivity in ways that help the community see how students and programs in The Warehouse are infusing the city with life. The winning student or team will receive $1,500 and have their work professionally installed. 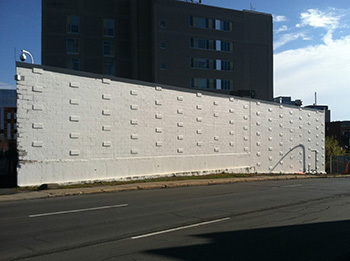 This large wall facing West Street is one of two that will showcase the winning design. The project is being managed by Quinton Fletchall ’13, G’15, who works for Syracuse University’s Office of Community Engagement and Economic Development as a Connective Corridor Engagement Scholar in the role of public art project coordinator. Fletchall is also is a part-time VPA instructor, a current graduate student in the CRS program and a graduate of VPA’s industrial and interaction design program. Applications are due from students by noon on Feb. 16. Applications may submitted by hand or in PDF form to Quinton Fletchall, Syracuse University Connective Corridor, Warehouse fourth floor, Room 405, or by email to qdfletch@syr.edu or corridorpublicart@gmail.com. The applications will be judged by a panel of University alumni, faculty/staff and community members. The winner will be announced March 2. 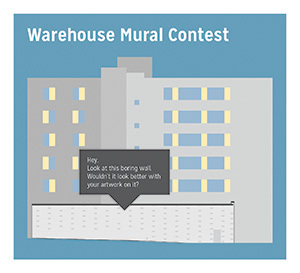 To download Adobe Illustrator templates of the walls, visit: http://connectivecorridor.syr.edu/warehouse-mural-project/. For more information, contact Fletchall at qdfletch@syr.edu.